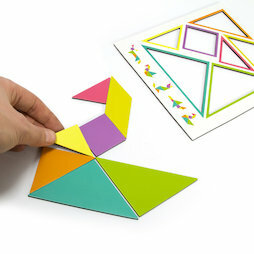 A Tangram (literally 'seven boards of skills') is a dissection puzzle consisting of seven flat shapes, called tans, which are put together to form shapes. It is divided into two large, one medium and two small triangles as well as a square and a rhomboid. From these magnetic sheet pieces, you can create countless shapes such as animals, ships or figures – let your imagination run wild! One single rule: All pieces of a Tangram have to be used and they can't be placed on top of each other.